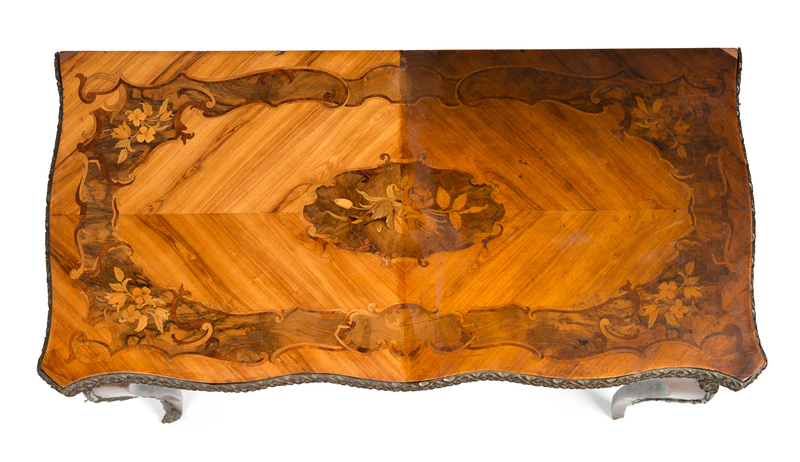 It’s always exciting to see antique furniture restored and the worse the condition before, the more fabulous the result often is and this marquetry card table which was purchased on our last buying trip, is a perfect example of this. 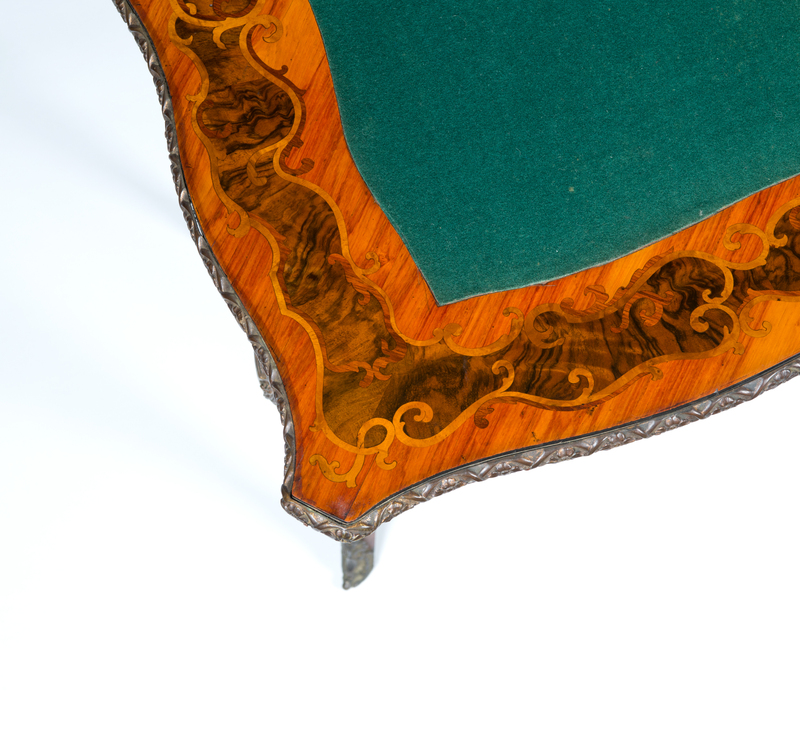 With decades of exposure to sunlight and dirt, the marquetry on top on this card table had been almost completely obscured by old polish that had lost its translucency over time. We knew that the card table was extremely fine, however we were curious to see just how good the marquetry was underneath. Caption: Marquetry surface of card table, clean from centre left and with original polish and dirt centre right. So… last Friday afternoon, with several of us gathered around in anticipation of what would be revealed, Nick set to work to remove the top layer of polish. The process is slow and with each circular motion of the cloth, a little more dirt is removed and a little more original detail is revealed. What is so interesting about this process is that often a piece of antique furniture can look quite ordinary in terms of quality before it is restored, because the natural grain and figuring of the timber has been obscured and the piece ends up looking quite one dimensional unless it is gently cleaned. Prior to this clean, no colour in the flowers was evident on this marquetry card table, no pen-work in the leaves could be seen or shading to create dimension, nor could the beautiful cross-banding of the alternating satinwood and kingwood scrolls. 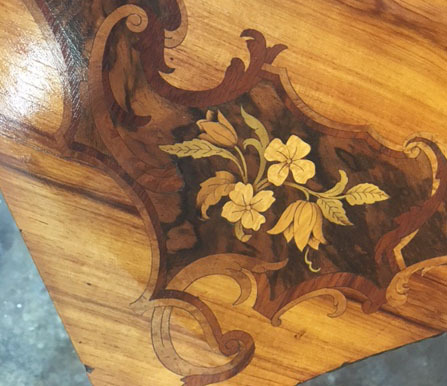 This marquetry has been inlaid into tulip-wood and a burr walnut background. There were a few clues as to the quality of this piece prior to cleaning. The overall serpentine shape of the piece is excellent and an expensive shape to achieve well. The proportion is very good, the ormolu nice quality and well cast and when the lid if lifted, it does reveal a fabulously inlaid playing surface. Click here to enquire about this card table.